Exciting turtle encounter this morning for surveyor Secret Holmes-Douglas and volunteers JoAnn Weatherford and Ron Speer! This loggerhead had to maneuver around lounge chairs but was able to successfully nest. When you enjoy the beach, remember to take your stuff at the end of the day and fill in holes. 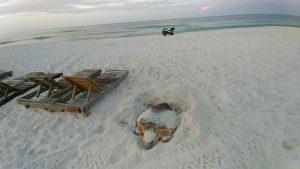 We have 20 loggerhead nests and are on pace for another record season! 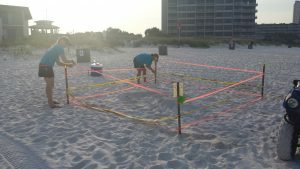 Volunteers Rich and Isis Koenders were busy last weekend protecting four loggerhead nests, and this week started with another nest marked by volunteers Jessica Graham and Kim Christian. Our current total of 14 loggerhead nests sets a new record at this early stage of the season! 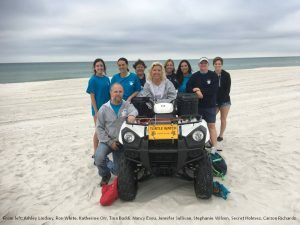 If you see a nesting turtle on Panama City Beach, immediately call the Beach Police at 850-233-5000 and Turtle Watch volunteers will respond. 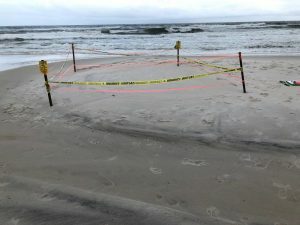 Subtropical Storm Alberto washed away two nests on Memorial Day, but thankfully Alberto’s impact was small since only four nests were on the beach when the storm hit. We currently have six nests, all loggerheads. We’re on the board with our first nest of the season! 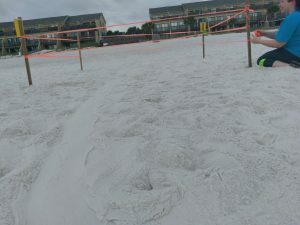 It’s a loggerhead nest at Largo Mar Condo on Thomas Dr, found this morning by surveyor Secret Holmes-Douglas and volunteers Erica Rodgers and Angela Barros. Hooray!! !